Kaci Ponsart '22 waits for a pass. 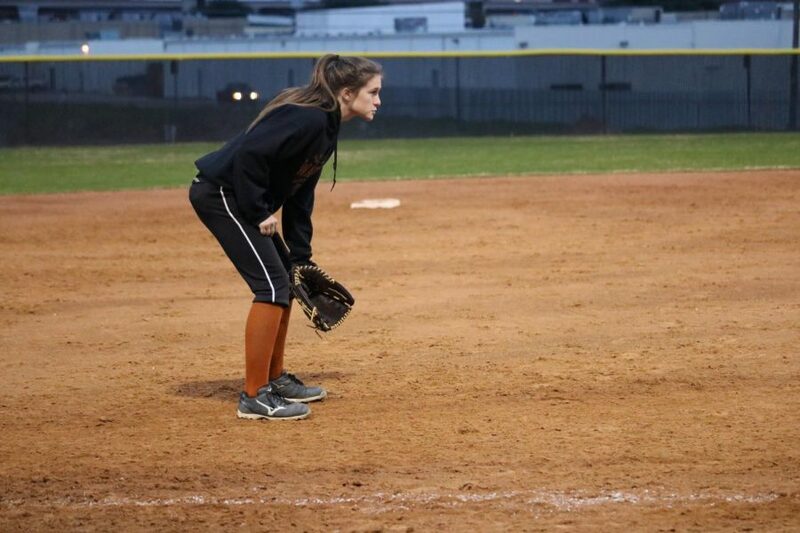 The JV girls’ softball team started off the season with a scrimmage against the Georgetown Eagles on Wednesday, Jan. 30. In the first inning, Georgetown took the lead by scoring five runs. The Lady Warriors had a good attempt at defense, but fell short in stopping the Eagles from bringing in multiple runs of their own. The Warriors responded with good hits from Emma Marsden ‘21 and pitcher Bella Gallardo ‘21 in the second inning, however, the Eagles caught the hits and left the Lady Warriors with no runs. In the third inning, the Lady Warriors stepped up their defense, and Sarah McCaughey ‘22 caused an out by beating an opponent to second base. A catch by Teddie Hall ‘22 ended the inning 8-0, in the Eagles’ favor. 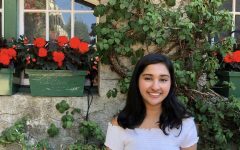 “We could definitely work on our communication and knowing the different rotations because we’re all kind of new at this,” Izzy Correll ‘22 said. Angelina Rendon ‘20 was the first batter in the fourth inning, and was the first of the Lady Warriors to make it all the way to second base. The team was unsuccessful in making any runs in the inning however, ending it 8-0 for the Eagles. Good catches by Correll and Katherine Yan ‘22 were featured in the fifth inning, preventing the Eagles from scoring a lot of runs. The sixth inning started out badly for the Lady Warriors with two people striking out, but Correll fought back with a good hit that placed her at first base. The game ended with strong defense by Hall and Yan, but the Eagles still came out ahead in the game, 15-0. “Overall we just need to work harder, practice more, and know our plays a little better,” Gallardo said. The Lady Warriors will take on the Glenn Grizzlies on Tuesday, Feb. 5.